The Holy and wonderworking icon of Panagia Soumela or Panagia Soumeliotissa, painted by the hand of St. Luke the Evangelist. The existing icon of Panagia Soumela was iconographed by the Evangelist Luke who was both a physician and an iconographer. According to tradition, whenever Luke drew icons of the Panagia, the Holy Mother was very pleased and blessed his works. Furthermore, she encouraged him to draw more icons. When Luke died, his disciple named Ananias, took the icon and transferred it to the Church in Athens that was dedicated to the Panagia. 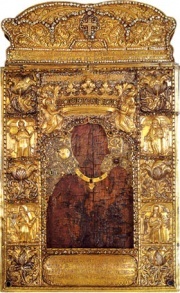 Here the icon was venerated as “Panagia Athiniotissa”. Close-up of Panagia Soumela Monastery seen from across the Altındere Valley. At some point two Athenian monks were called by the Virgin to follow the Panagia Athiniotissa from the Church in Athens to Mount Mela in Pontus of Asia Minor, a region in current day Turkey. They were St. Barnabas, and his acolyte St. Sophronios. At Mt. Mela, the icon was found in a cave at the end of the fourth century A.D. A monastery was built at this place to the glory of God, and the icon was renamed 'Panagia Soumela'. The monastery was inaugurated by the Bishop of Trapezounta in 386 A.D. During the decline of the Byzantine Empire, the monastery served as a centre of education. The monastery was pillaged many times but was always rebuilt, with the latest construction occurring around 644 A.D.
Trapezounta was occupied by the Turks in 1461 and so was the monastery. Despite these difficult times, the monks remained in the monastery unshaken in their faith and tradition. The monks in the monastery were finally forced to flee in 1923 following the barbaric period of the genocide of Greeks in Asia Minor including Pontus. Before fleeing the monastery, certain items were buried in the front yard of the Church of St. Barbara which was built at a short distance from the monastery by St. Sophronios. The little church was only one kilometre from the monastery. The items buried included the icon of Panagia Soumela painted by the Evangelist Luke, the handwritten Gospel copied on parchment by St. Christopher, and the Holy Cross with the honourable wood donated by Emperor Manuel Comnenos. This event took place in August of 1923. In 1931 on the feast day of the Dormition of the Theotokos, at the monastery of Mega Spelion (the Great Cave) in Kalavryta, Peloponnesos, Greece, many people had gathered to pray before another icon of the Evangelist Luke, the Panagia Speliotissa. Amidst the crowds were many Pontic Greeks and the Greek Prime Minister, Eleftherios Venizelos (1864- 1936). Metropolitan Polycarp of Xanthi mentioned the hidden icon of Panagia Soumela to the Greek Prime Minister. Upon hearing this account, Venizelos was touched and made a promise that he would do whatever was possible to retrieve the icon. During the same year, Eleftherios Venizelos met the Turkish Prime Minister Ismet Inonu, and asked for his permission to send monks to the Mt. Mela monastery to retrieve the icon and the other sacred treasures. Father Ambrosios, who was one of the monks of Panagia Soumela, was chosen by Metropolitan Chrysanthos of Trapezounta to undertake this special journey. Father Ambrosios set out to go to Turkey on October 22, 1931. Upon arriving at the sacred site, Father Ambrosios was moved with tears. The laborious task of excavating began. Turkish soldiers and Greeks helped, including Father Ambrosios. Soon the hidden icon was unearthed along with the other sacred objects. They were all returned to Athens and deposited at the Benaki Museum in Athens for 20 years. Monastery of Panagia Soumela, Vermion Mountain, Veroia, Greece. In 1950, Dr. Philon Ktenides encouraged fellow Pontic Greeks in Greece to build a new church for Panagia Soumela. The church was built on a site amid the Macedonian mountains in Greece. This sight was Kastania of Vermio. It was chosen because it reminded Dr Ktenides of the wild and natural beauty of the heights of Mt. Mela in Turkey. In 1951 the icon was transferred from the Benaki Museum to Kastania in Macedonia. The miraculous icon was enthroned at Kastania on the 15th of August 1952. Even though the new home of the icon is called the Monastery of Soumela, there are no monks or nuns who live in this remote mountain site. The Church of the Dormition may be visited by pilgrims and tourists. Every year on the 15th of August which is the feast day of the Dormition of the Theotokos, thousands of pilgrims from around the world travel to this Monastery at Mt. Vermion to venerate the holy icon. The original Soumela monastery in Turkey, is also accessible to the pilgrim and tourist. The monastery's four storey façade remains in good condition, although the back is destroyed. Located at an altitude of 1,200 metres, it is a magnificent structure. It clings to sheer basalt wall, high above green forests and a mountain stream. Many of the sacred icons have suffered as targets from desecrators and graffiti scribblers. The monastery once upon a time housed 72 cells, guest quarters, an aqueduct, small chapels, icon room, library and dormitories. Many Pontians in Greece have migrated to Australia. In Victoria alone there are 35,000 Greeks of Pontic descent. In 1972, the President of the association Panagia Soumela in Melbourne, George Papadopoulos travelled to Kastania in Macedonia. He met the Executive Committee of the Panhellenic Holy Foundation of Kastania Veroias. He expressed to them the long heartfelt desire of Pontic Greeks living in Australia to have a copy of the holy icon of Panagia Soumela to venerate. This noble request was met by the Greek authorities and a copy of the icon was presented to George Papadopoulos on October 1972 in Thessaloniki, Greece. On the 8th of June 1982, the copy of this historic icon was presented to His Grace Bishop Panteleimon of Theoupolis, the Greek Orthodox Bishop of Melbourne at that time. Every year on the 15th of August, the icon of Panagia Soumela was brought for veneration by all Greeks in Melbourne to the Greek Orthodox parish of St. Nicholas in Yarraville. The late Father Antonios Amanatidis, who was the founder and parish priest of St. Nicholas during that time, was a Pontic Greek by descent. He saw this gesture of having the icon brought to St. Nicholas parish as a move towards uniting the various Pontic clubs in Melbourne. In 1992, a new Greek Orthodox parish was being built in East Keilor, Melbourne. 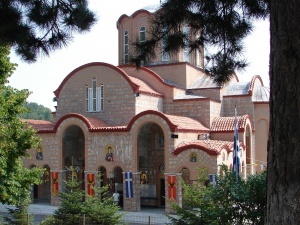 His Eminence Archbishop Stylianos (Harkianakis) of Australia wanted this church to be named the Dormition of the Theotokos Panagia Soumela due to the fact that many Pontic Greeks lived in the area. The icon of Panagia Soumela was enthroned in the newly built Church of Panagia Soumela East Keilor on Sunday May 4 1997, the same day the Church was officially opened. At the moment, the Church is triune, meaning that it also has two chapels, dedicated to St. John the Theologian, and our Holy Godbearing Father St. David of Euboea (Evia). Many Pontic Greeks flock to the Greek Orthodox parish of East Keilor every year on August 15. On Sunday, August 15, 2010 Ecumenical Patriarch Bartholomew I conducted the first Divine Liturgy in 88 years at the historic monastery of Panagia Soumela in Trapezounta, northeastern Turkey. This marked the first official religious service carried out at the ancient monastery since the foundation of the modern Turkish Republic. Greece's Prime Minister George Papandreou, speaking after attending mass on the Cyclades Islands off the Greek mainland, welcomed the "historic and important event." It was a sign of bilateral rapprochement with Turkey and reflected "a spirit of cooperation and peace between us and our neighbour," the prime minister said. On Sunday, around 500 Pontian Greeks were allowed into the fourth-century monastery, while around 2,000 others who came from Istanbul, Greece, Russia and Georgia, watched the mass on a giant television screen outside. In May Turkey sent a letter to the patriarch authorizing the Divine Liturgy to be celebrated here once a year on August 15, in a gradual loosening of restrictions on religious expression. [note 1] The gesture appeared aimed at Turkey's own Greek Orthodox minority, thought today to number around 2,000 people. In a similar gesture to Turkey's Armenian minority, Ankara also authorized mass to be celebrated in September at the museum-church of Akdamar, in the eastern Van province. ↑ Turkey's government is seeking to improve the lot of ethnic and religious minorities in line with its bid to join the European Union. Activists say the change is too slow. A key Orthodox Christian demand is the reopening of the Theological School of Halki near Istanbul. (Associated Press. Turkey: patriarch holds historic Mass. August 15, 2010). Mother Nectaria MeLees. "Between Heaven and Earth: The Monastery of the Panagia Soumela". Road to Emmaus: A JOURNAL OF ORTHODOX FAITH AND CULTURE. Vol. IX, No. 1 (#32). 6 pp. St. George Greek Orthodox Cathedral, Greenville, South Carolina. The Incredible Story of the Miraculous Icon - Panagia Soumela. Greek Orthodox Metropolis of Atlanta. Full of Grace and Truth Blogspot. The miraculous icon of Panagia Soumela, and Sts. Barnabas, Sophronios and Christopher the Righteous. Monday, August 3, 2009. Kon Bouzikos. The History of the icon of Panagia Soumela. Pontus World. Nicolas Cheviron. Turkey monastery celebrates first mass in 88 years. AFP. August 15, 2010. BBC NEWS Europe. In pictures: Historic Orthodox Mass at ancient Turkish monastery. 15 August 2010 Last updated at 11:44 ET. Panagia Soumela Monastery, in Trabzon Province, modern Turkey. Panaghia Soumela: Periodical Publication of Paracletos Monastery. Abbeville, South Carolina. December 2008, 1st issue. George Andreadis. Crypto-Christians in Pontus. Pravoslavie.ru. Road to Emmaus, Vol. VIII, No. 4 (#31). 11/06/2010. This page was last edited on January 8, 2011, at 16:12. This page has been accessed 28,362 times.